HUNTERS ALL! — With the deer hunting season in full swing in the San Bernardino Mountains, sportsmen on Oct. 11, 12 and 13 may run into most any kind of a “deer” with the 5th annual Pioneer Pass Golf Challenge being played and featuring the 28-mile “World’s Longest and Only 19th Hole” between Yucca Valley and Big Bear Lake. 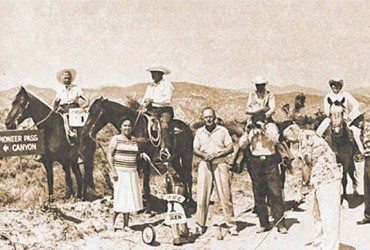 Here golfer, “Miss Pioneer Pass” (Georgene Bradshaw) breaks up the hunters — and the deer too. 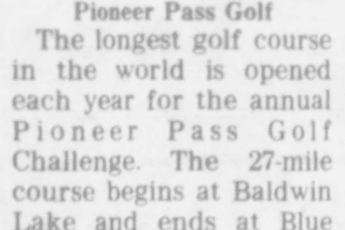 YUCCA VALLEY– The Fifth Annual Pioneer Pass Golf Challenge will feature the 28 mile “World’s Longest and Only 19th Hole,” connecting the Hi-Desert with the resorts of the San Bernardino Mountains. It is sponsored by the Park and Recreation Districts of Big Bear Valley and Yucca Valley. 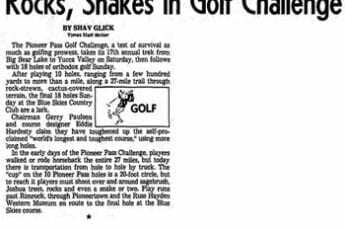 The “PPGC” will be played next weekend, beginning with the first nine holes of the Yucca Valley Golf Club and closing with the final nine holes of the Moonridge Golf and Mountain Club in Big Bear. In between, play moves from the spectacular beauty of the High Desert to the Alpine Meadows of Big Bear Valley over the historical Pioneer Pass linking the two areas. This zany, wacky tournament is open to all comers with entries coming from far and wide, according to William Cole, manager of the Yucca Valley Chamber of Commerce and publicity director of the event. Prizes and awards will be given top finishers, plus awards of unusual distinction for those achieving certain scores along the course after the conclusion of the tournament. Each participant finishing the Pioneer Pass Golf Challenge will be given a special participant’s award for this accomplishment stated Cole. Special events including a 19th hold Kick-off Dinner, a Chuckwagon Breakfast, special entered lunch on the course, plus coffee and doughnuts at certain checkpoints as required. A victory dinner will close the PPGC on Sunday evening in the popular Moonridge Golf and Mountain Club in Big Bear.